Zico Mount Delrin Tool Clip, 1.75", 1 5/8", 1 7/8"
1.75" heavy duty thermoplastic spring clips: Clips are non conductive, non-magnetic and non-corrosive. Ideal for indoor or outdoor use. 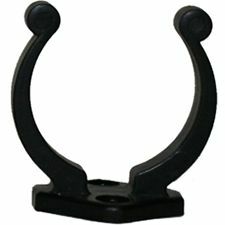 These heavy duty, thermoplastic spring clips put an end to your tool holding problems. Keep shovels, brooms, flashlights and other various items safe from being marred or scratched. Designed with rounded edges, these spring clips help prevent injuries. CLPR-175-B has a diameter of 1.75" and an expansion range of 1-5/8" to 1-7/8".